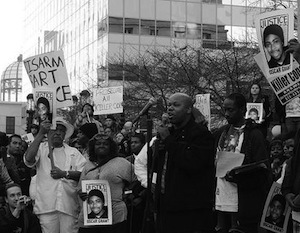 Oscar Grant, a 22 year-old black man, was fatally shot on New Year’s Day, 2009 during an altercation with the Bay Area Rapid Transit (BART) Police Department in Oakland, California. The United States has an unfortunately long history of questionable altercations between police and citizens where people wind up dead or injured. Whether it was the rioting that followed the ‘not guilty’ verdict in the case surrounding Arthur McDuffie’s death in Miami in 1980, the similar riots that occurred in Los Angeles following the verdict in the Rodney King case in 1992, or the protests that have followed the ‘involuntary manslaughter’ ruling on July 8th in the case of Grant’s death, public outcry, in various forms, is never far away. By virtue of the fact that he was unarmed at the time he was shot, Grant’s death has earned some uneasy comparisons to the deaths of Amadou Diallo and Patrick Dorismond who were shot to death by members of the New York City Police Department in 1999 and 2000 respectively. The officers involved in both cases were acquitted of all charges. MP3: Le Tigre :: Bang! Bang! @A Certain Man – Your hypothetical ‘police’ song would be interesting. I can imagine a lot of jingoistic police songs about the mythical ‘guardian of society’ precept of police, but much harder to look at the honest people who walk the beat; people who are just as likely to make awful, awful mistakes as the rest of us. If Johannes Mehserle is to be believed, and he truly did draw his gun by accident as opposed to his taser, then it would make a fascinatingly insightful song subject over the nature of guilt over split-second reactions. While I don’t think that a person’s job should prevent them from being scrutinized under the same set of laws, being a police officer adds an extra layer of density to the nature of those decisions and the repercussions of such. i’ll offer another folk/ punk a side/ b side: “the lonesome death of hattie carroll” by bob dylan backed with “police truck” by dead kennedys. i’d buy that seven inch.